1 Welcome to our ethereal space on the mystic void that some have called the Internet. So your curious about our little vendor house are ye? Not a problem, we don’t mind visitors! Actually, we look forward to your visit and hope that we can help fulfill some of your shopping needs. Traveling the winding road leading from Britain to Yew, as you turn northeastern and pass by the lich strewn woods you’ll find a small outcrop of trees. In this green pasture area, with it’s lush houses you will find our little vendor house directly in the center. It was once owned by the Romaq Guild who used it to sell wares to guild members and friends. 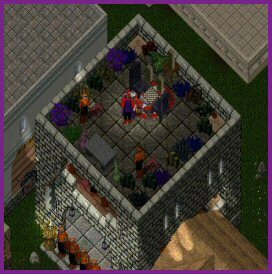 However, many moons ago, some new housing opened up and the Romaq Guild moved closure to Vesper. 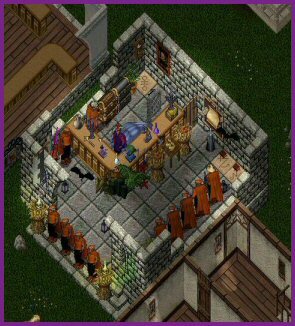 Having the small shop so far away from their main guild headquarters was a bit of a hassle plus they had much more room in their new location so the shop was handed over to Lord Anev. This particular little shop has actually been around for over three years and has hosted a variety of vendors in its time. With the recent changes to our lands and a new chapter in the sales of goods, Anev & Company decided to expand out its services. For the first time in this little house’s three year history, it was demolished and then rebuilt to better serve those seeking its service. It now features a larger layout and has gotten rid of the funky stairs and doors that always seem to hinder most visitors shopping. 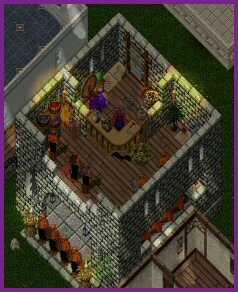 Anev & Company Vendor House also started renting out space to more merchants due to the constant traffic flow our little area can see. 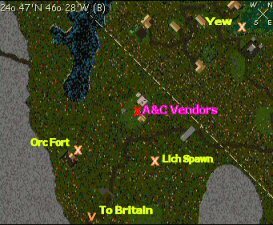 Being so close to the Yew Orc Fort and the vile woods that lich have claimed, adventures seeking their chance at fame and fortune are constantly running in as they either take refuge or look to re-supply from their mighty quests. It’s also one of the closest shopping areas in this remote area of our lands and many of our neighbors use it as a first stop while searching for items to restock their supplies. The store is managed by Midrick, Anev’s trusty assistant who can always be found wandering around the shop cleaning or checking on inventories. Orre Holderman recently started as Assistant Manager to help when Midrick is away and Tabitha Trimble was enlisted as the seamstress for the shop. Tabitha took on the unique role of deciding on themes and costumes for each vendor. Midrick is always seeking to add more vendors to the shop and to keep the stores selection not only fairly priced but also to have a wide selection of items for patrons to choose from. One unique caveat that our store holds is its large selection of un-enhanced armor and weapons. Enhancing these items is a tricky talent and over time smiths and tailors alike have come to the shop to buy items as they train their talents. Along with a large selection of armor and weapons, the house also has a huge selection of rings and bracelets both for the more experienced warriors and for those just starting out on their long journey. This little vendor house continues to grow and expand, our search for new merchants continues. We constantly encourage all our merchants to vary their stock both in items and price. Each of the store staff spend many hours shopping at other local shops, we compare prices, look for new ideas or items to sell and look for places that we can direct our customers to when we aren’t able to have just what they need. If you’re interested in joining the merchants at Anev & Company, send an email to the A&C Staff at acvendors@anev.com. And as always, if you have questions or needs, please feel free to seek out any one of the A&C Staff.